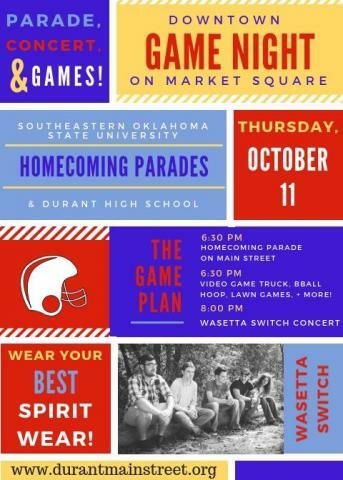 Southeastern Oklahoma State University and Durant High School invite you to be a part of the 2018 Homecoming Parade on Thursday, October 11 in Durant! The theme is “Out of this World” and starts at 12th & Main at 6:30 p.m. After the Parade, head to Market Square (1st & Evergreen) for games, food trucks and a concert by Wasetta Switch. PARADE ROUTE: The parade route begins at the intersection of North 12th Avenue and Main Street. Entries will proceed east down Main Street through Downtown to the intersection of North 1st Avenue, at which point the parade will turn left (north) onto North 1st Avenue. The parade will then disperse at Beech Street and 1st Avenue. ENTRIES/JUDGING INFO: 1st, 2nd and 3rd place overall will be award in each of the judging categories: Durant, Southeastern, Community. Your entry should be plainly marked with the name of your organization on the right side of your entry (passenger side) to assist judges in their scoring. Judges and Announcer stand is located on the southeast corner of 4th and Main St. at Mickle Law Office. Entries must reflect the “OUT OF THIS WORLD” theme to be eligible for judging. Entries will be judged on Theme Relevance, Creativity and Visual Appeal. WEATHER: In case of inclement weather, please check back here at www.durantchamber.org or on Facebook at www.facebook.com/durantchamber (Durant Area Chamber of Commerce) for any updates on parade status.